"Guitarist and singer-songwriter Ryley Walker discovered the 1972 private press LP in a Chicago record store, loved what he heard, and teamed with Tompkins Square to produce the reissue.John Hulburt (1947-2012) was a member of legendary mid-60's Chicago garage rock band The Knaves, whose records were recently reissued by Sundazed. 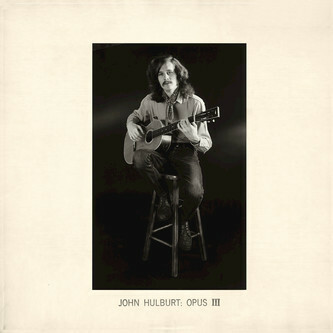 Opus III showcases his exceptional talent on the acoustic guitar, proving somewhat of an anomaly in a city not known for its solo guitar recordings during this era.Walker writes in his liner notes, "Solo acoustic guitar music was adopted by several in the Berkeley school and the ever expansive roots fanatics in the South, but here in the middle of the country with harsh winters and the landlocked prison of corn fields, it was almost destiny that the amplifier assault of electric blues and controlled chaos of dance music came from the South Side. "Opus III has another notable Chicago connection : It's one of the earliest studio credits for Styx and Ohio Players engineer / producer Barry Mraz. Styx's debut album would also be released in 1972.The reissue of Opus III includes illuminating liner notes by John Hulburt's sister, Cynthia Fritz; The Knaves' Gene Lubin; and Ryley Walker, as well as vintage photographs. ‘Opus III' Originally Released as Clarence Records CR-003, 1972. Recorded at Plynth Studios, Chicago February/March 1972 Engineer:Barry Mraz"